The hedgehog has long been a symbol of many admirable virtues, including wisdom, diligence, and kindheartedness. In the fairy tale about the hedgehog’s coat, resourcefulness, courage, and patience enable the puny hedgehog to marry a princess and turn into a stately prince. At the start of this tale, an elderly couple without children of their own are given an infant by the Forest Mother. The child is unusual, as he has the skin and hair of a hedgehog, but he is good-mannered, helpful to his parents, and well-loved. One day the boy, now a young man, meets a king and a princess who are lost in the woods. The hedgehog boy offers the king directions home in exchange for his daughter’s hand in marriage. On their wedding night, the princess discovers he is a hedgehog and her love for him turns sour. In retaliation for his connivance, she burns the hedgehog’s coat, which had hidden his hedgehog attributes. Her husband becomes sick and almost dies, but with her loving care he heals and becomes a handsome young Prince, and she ends up with the man she wanted. The coin, which is oval in shape, is produced by the Mint of Lithuania on behalf of the Bank of Latvia. It is designed by Gundega Muzikante, a well-known children’s book author; this is her first project for the Bank of Latvia and collector coins. The obverse features a charming illustration of the princess carrying a hedgehog in her apron. 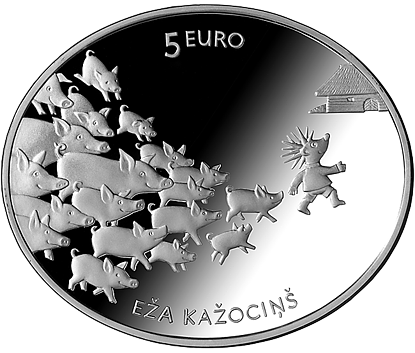 The reverse shows a herd of swine, which serve as the antagonists of the hedgehog boy in the tale; the boy is seen leading them toward a typical Latvian farmhouse. This Latvian fairy tale has been included in Ride with the Sun II: An Anthology of Folk Tales and Stories from Countries of the United Nations. 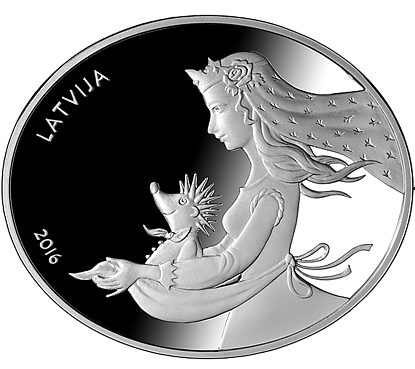 This is the second coin in a special collector series dedicated to the most dearly loved and significant Latvian fairy tales. The first one honoring a tale about five cats was issued last year and has become highly popular. The coin is available in Latvia at traditional points of sale, such as coin shops, book stores, souvenir shops, and jewelery shops. Collector coins and other numismatic products issued by Latvijas Banka are also for sale online from the JSC “Latvijas Pasts” No information for international sales is yet available. Yes, they release only one crown size coin each year so I was keeping an eye on it. Infact I also follow NBS website for news and their they also share results of coin design competitions. They usually award 1st, 2nd and 3rd prize and the winners design is minted. They are often very competitive and beautiful.